She refused to descend into self-pity. That’s what Grace Henry insisted as she slipped off her navy suit jacket and hurled the garment on the bed. After tugging off her pencil skirt, she slipped on yoga pants and a cotton tee, sank onto her bed, and grabbed her cell phone from the nightstand to return her mother’s call. Or rather, her mother’s two calls. “I hope this interview was better than the last,” her mother said when she answered. Grace resisted the urge to run to the bathroom and peer into the mirror to see if her nose had grown. What she’d said couldn’t be farther from the truth. How ironic when she’d been hopeful for this interview at the company of a casual friend. But she’d no sooner sat down across the desk from her supposed friend when the woman blasted Grace. I only agreed to see you so you’d quit wasting your time. No one in this city will hire you. Word is you cut a deal to get yourself out of trouble. Those who don’t think that are scared if anything is the least bit suspicious in their company, you’ll bring the FBI down on them, too. Numb, and wanting to run as far and as fast as possible, Grace thanked the woman for her honesty, snatched up her briefcase, and scooted out of the office. Never once had she considered defending herself. What was the point? Not a shred of evidence pointed at her involvement in the embezzlement at her former employer, but none of that appeared to matter. How could this happen when she’d done the right thing? When the authorities swooped down, zeroing in on her ex, Derek, she’d been questioned because of their past relationship. At first the FBI suspected her of being involved, but when they failed to find evidence, they changed tactics. The interrogations stopped, and instead they approached her to gather evidence against Derek. She’d agreed. How could anyone whose moral compass pointed close to north do otherwise? Unfortunately the information she turned over uncovered other financial irregularities, including massive overbilling of clients. That, combined with the embezzlement, toppled the company. “I hope you’re right about this job,” her mom said, pulling Grace back to their conversation. “Asking about your interview wasn’t the only reason I called,” her mom said, cutting her off. Grace sighed. She shouldn’t be surprised her mother had an ulterior motive. That was their pattern, but today the fact stung. Just once she wanted a call to be solely motivated by her mother’s concern for her. Yet another family debacle. The last of many. Looking back on her childhood, Grace couldn’t remember a time when her parents got along or appeared to share genuine affection for each other, certainly nothing resembling love. Her father’s job as a New York City cop, and the fact he preferred to blow off steam drinking with his buddies rather than spend time at home, served as a constant problem between them. Her mother’s eventual coping strategy had been to have an affair. A fact Grace discovered one day in high school when she came home sick from school. Despite their divorce when Grace left for college and despite both remarrying, her parents couldn’t let go of their anger and move on. If anything, their bickering had grown worse, as evidenced by Brianna’s baptism last weekend. To eliminate potential problems, her brother assigned each parent a specific time to attend the celebration at his house. But that hadn’t worked, because the pair got into a shouting match in the driveway in full view of the neighbors, loud enough for the guests inside to hear. Grace rolled her eyes, hating her mother’s the-devil-incarnate tone when she referred to Grace’s father. Didn’t she realize half of who her children were came from their father, and in criticizing him, she criticized her children, too? Yeah, but then Dad will hear what I did, and he’ll be mad at me. Grace winced. She could’ve done without that reminder today. Her chest felt as if someone had reached inside and squeezed her heart. This wasn’t what she needed right now. Why couldn’t her mother put her first, instead of asking for help when Grace had nothing left to give? Grace mumbled another she’d think about the offer, ended the conversation, and then feeling an overwhelming need to vent, she called her best friend, Cassie. She couldn’t bring herself to tell Cassie what had happened. People said the truth hurt, and boy, did it, especially when she hadn’t been ready to move on from denial. But now she’d been forced to. Some days it felt as if that was all Grace had left. Cassie had moved to Wishing, Texas, four months ago to raise her niece, Ella, when her sister and brother-in-law died in a plane crash. Along with that responsibility came running a bed and breakfast. However since then, Cassie’s art career had taken off, and she spent time helping her fiancé, Ty, run the “cowboy experience” tourism business on his ranch, leaving her little time for the B&B. “Grace, you’re brilliant, and someone is going to hire you sooner than you think.” Cassie’s excitement bubbled through the phone. “Girl, if it had flames, it was a fire,” Grace said in all seriousness, but two seconds later burst out laughing. While she had other friends and acquaintances, or rather believed she had, no one ever understood her like Cassie. No one made her laugh when she felt like crying. Maybe the idea wasn’t as harebrained as Grace first imagined. Her business and marketing background would be an asset running the inn. The thought of a new challenge sent tingles racing up her spine. Could this be fate’s way of saying she needed to move in a completely new direction? Make a fresh start? She considered her life in New York. Friends she’d believed would be there for her during hard times had avoided her as if she had a contagious disease. Then there was her family. The people who should put her first, ones she should be able to count on, drained her with their squabbles and insistence she play peacemaker. Escaping the family drama was a powerful lure. The day AJ met Ty when they moved into Utay Hall at Texas A&M University in Squadron Twenty-One of the Corps of Cadets, he knew they’d be friends, but they’d become much more. Ty was the brother AJ never had. Over the years, Ty’s family ranch, the Bar 7, became AJ’s second home. He loved visiting, especially in the summers. Fishing, riding horses, shooting targets and tin cans, swimming in the lake. What wasn’t there to love? But living, or rather working, in Wishing? He’d found that to be a horse of a completely different color, but then taking the chief of police job hadn’t been his idea. When his friend, Jack Mitchell, suspected someone in or around Wishing was forging Social Security and Green Cards, drivers’ licenses, and other government documents he contacted the Bureau. Considering Jack’s experience with the Chicago PD, the FBI felt comfortable leaving the town’s chief to investigate the case. After Jack’s death, the FBI wanted to place an agent in Wishing to finish what Jack had started. Working a two-bit forgery case in the middle of nowhere, east Texas, wasn’t exactly what AJ had in mind for an assignment, and he told Masters that. His boss responded with a lecture on taking one for the team because AJ was the best man for the job considering his familiarity with and contacts in Wishing. Then he added AJ was free to refuse the assignment, however, if he chose to do so there would be ramifications. Faced with that information, AJ packed his bags, and headed for Wishing, figuring he’d be there a couple weeks tops. But gaining information had been harder than he expected. Now two months had passed, and he was no closer to breaking the case. Which meant he was no closer to returning to Houston and work that mattered. As AJ drove on the narrow, pot-hole-ridden, two lane farm highway toward Ty’s place, he wondered how to kick his investigation into high gear. If he didn’t, his duties as chief would drive him insane. Instead of spending every minute ferreting out the forger, he spent his days mediating petty squabbles between neighbors, writing enough jaywalking tickets to stretch to Dallas, and fighting to bring a staff into the twenty-first century. He parked his truck in the driveway near the barn, staring out at the land he loved. Perched on Lake Hope, the Bar 7 couldn’t be in a better spot. All a body had to do was walk a few feet and he was set for fishing, boating, or sitting on the dock staring at the water. Added to that was plenty of open fields for horseback riding and raising cattle. AJ envied his friend’s stability, something solid to hand down through the generations. If he intended to live in Wishing, but that wasn’t what he wanted. Weekend getaway? Sure. Hopefully soon he could buy land here. Probably not on the lake, but around Wishing. A place he could come to on weekends or when he needed to get away. But other than that? No thanks. And meet a few other criteria. She should be confident enough to handle not knowing the details of his latest case, or where he was going. She had to cope with the fact every day he walked out the door might be the one he failed to return. She needed to have her own life. One separate from his. He had to know she’d be okay if she was on her own again. That took a special breed of woman. One damn hard to find. “What’s up, Lu?” AJ scratched behind the mare’s gray ears, and she titled her head, gazing at him with big brown eyes, as if remembering the long rides they’d shared over the years. “Have you talked to Coop?” AJ asked referring to their Squadron 21 buddy, Cooper Abbott, a veterinarian in College Station. “I don’t blame you. If Marjorie gets ticked, everyone in town will hear about it, and she’ll make your life hell. She ran off the first chief the town hired after Weston retired,” Ty said. For Mason, a man in his late sixties who’d lost his wife ten years ago, every problem was a crisis, demanded AJ’s immediate attention, and usually involved his neighbor of thirty plus years, Virgil. AJ was starting to think getting on Mason’s nerves was Virgil’s favorite sport, and he’d have to hire an officer whose sole responsibilities were managing those two troublemakers. 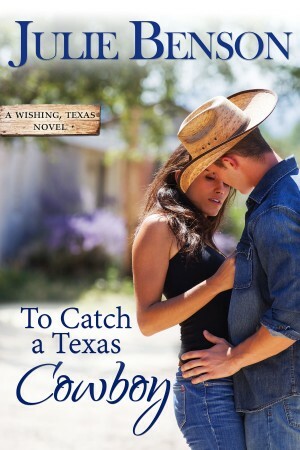 But when he headed for his truck, Lu kicked the corral fence as her high-pitched whinnies called out to him. He glanced over his shoulder, and her movements grew more frantic as she pushed harder against the fence. Then she reared up on her hind legs and kicked the boards, trying to knock down the rail. Concerned the mare would hurt herself or keel over from exertion, he turned around. He hadn’t taken two steps when the animals quieted. A minute later Ty returned shaking a feed bucket, the sound of grain brushing against steel loud enough for even the half-deaf mare to hear. When he held the food out to Lu, she turned her head away, and shoved her muzzle under AJ’s hand. 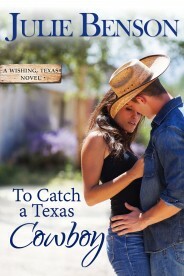 Did you know that To Catch a Texas Cowboy and many titles are available digitally from Tule's own bookstore? Check it out!